The FX markets and interest rates seemed mainly contained, awaiting the US central bank meeting later this week. 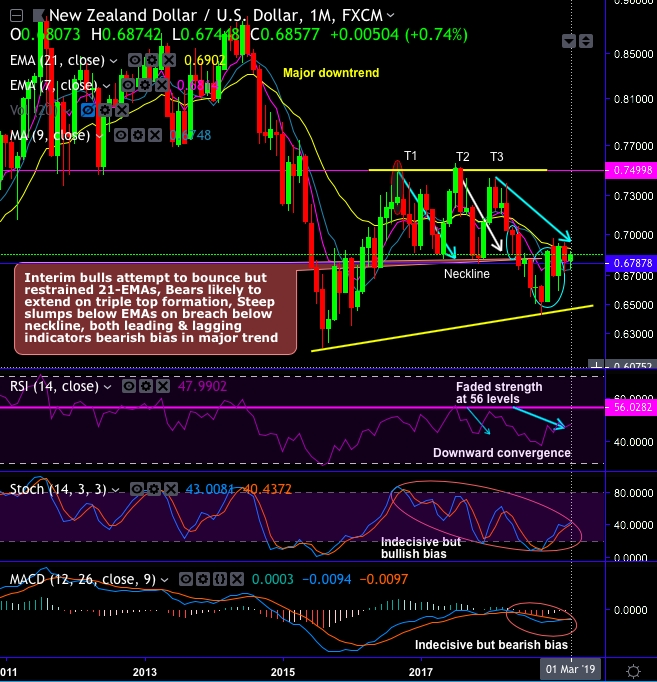 NZDUSD, in the short-term, seems to be slightly gaining upward momentum, levels of 0.6875 vulnerable to a retest today. The medium-term perspective: Contrary to the above, downside risks still remains intact, with 0.6600 levels, our multi-month target. Near term NZ economic data should continue to portray a loss of momentum, and that should result in dovish commentary from the Kiwis central bank. forecasts last month to reflect the risk of ongoing negative news-flow relating to EM. Fed hikes further through 2019 then the USD appreciation is most likely, consequently, NZDUSD will drop. Amid prevailing upswings in the NZDUSD which is minor in the major downtrend (refer above technical chart), 6m IV skews have clearly been indicating bearish risks. Hence, major downtrend continuation shouldn’t be panicked the broad-based bearish outlook amid minor rallies. These positively skewed IVs of 6m tenors signify the hedgers’ interests to bid OTM put strikes up to 0.64 levels (refer above nutshells evidencing IV skews). We reckon that the global risks play less favorably for NZ than they do for Australia, and the central bank has reason to be credibly dovish even as the data have outperformed some of the downside risk scenarios laid out earlier in 2018. NZD is also expected to depreciate to 0.65 by end of H1’2019. While the NZDUSD trade is underwater following positive news reports on a US-China agreement. The erratic nature of news flow is one reason as to why we suggested NZDUSD shorts via options in the past. 6m NZDUSD (1%) in the money put options have been advocated, in the money put option with a very strong delta will move in tandem with the underlying. As the put option moves further in-the-money (ITM) along with the corresponding underlying spot FX dips, the Delta’s absolute value also likely rise. As a result, it becoming more valuable for each pip (or points) movement in the underlying market. Hence, trade an ITM instrument if you wish to mitigate the risk of Vega and Theta. That is the best suitable sensitivity tool when you reckon a robust conviction on the underlying market because deep ITM options have the highest Delta. They are likely to act as if an open position in the underlying, however, if the underlying spot goes adverse, then the Delta declines so the loss becomes smaller. Currency Strength Index: FxWirePro's hourly NZD spot index is inching towards 31 levels (which is mildly bullish), while hourly USD spot index was at -67 (bearish) while articulating (at 06:06 GMT).